One of the most beautiful dining chair forms of the Federal period is the heart back chair, named for the shape of its back. While related to shield back chairs of the same period, heart backs incorporate three intersecting ovals which meet at the base of the back. 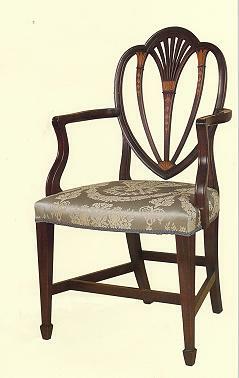 They were based on Neoclassical designs as interpreted by English cabinetmakers in the 1780's. Heart back chairs of various types were popular in Baltimore in the late eighteenth century. Our original chair is one of the only known set having this particularly rich inlaid decoration. The chairs were made about 1790 for Samuel Chase (1741-1811), one of Maryland's four signers of the Declaration of Independence who later served as an Associate Justice of the United States Supreme Court. Chase purchased the originals for his house located at Lexington and Eutaw Streets in Baltimore. An additional chair from the set is in the collection of the Maryland Historical Society. Our replica Baltimore Heart Back is an exact copy of this historically significant chair, and features a superbly inlaid back with satinwood bellflowers, fans, leaves and a shaded conch shell. The upholstered seat is raised on tapering legs with spade feet; the chair has a stretcher base which adds durability and strength for use as a dining chair. The symmetry and beauty of this richly inlaid chair is of the highest calibre. Dense South American mahogany and a hand rubbed shellac finish add depth and mellowness to this exquisite inlaid replica.